Traveling along the wild Albanian coast, after visiting tropical looking, white sand beaches at Ksamil, old town Himare and the surrounding seaside, I thought it just couldn't get better. 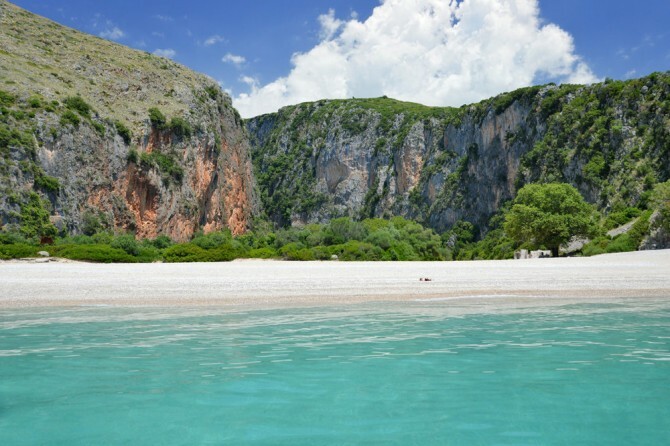 Then, we went to see the two beaches a few miles north from Himare - Jala and Gjipe, hidden in picturesque coves and surrounded by the spectacular canyon. The color of water was so unusually clear and the scenery so exotic that this spot could easily pass off as tropical heaven. Why is such a place still virtually unknown despite being right in the middle of Europe, is a mystery to me. But it's a good thing! You can feel as if it's your own, private paradise. And, if you want to still see it this way, hurry up, as unfortunately there has been some new development around - soon it may become as crowded as Albania's famous neighbors - Croatia, Italy and Greece. Jala beach is close to the town of Himare (have a look at the full post I wrote about Himare here), around 12 km (7.5 miles) north. The drive takes around 20 minutes. And, to drive, is the best option to reach Jala beach. There is no public transport that I know of. As I mentioned in other parts of the posts on Albanian Riviera, we were lucky to travel with a local couple - they drove us around and showed amazing, off the beaten path places for a great value. If you wish to arrange a trip in Albania, please let me know the dates when you're there via the contact form here, I might be able to help. Otherwise, you can try asking at your accommodation, they might be able to arrange something for you or alternatively, you can take a taxi - this will work well if you're traveling in a group. The beauty of Jala beach is spectacular, no pictures or words will convey how amazing it is in reality. The sea water is so intensely azure that the rocks underneath actually seem painted blue! For sure, it is completely opposite to what Albania is associated with in western media. But there is also a bad side to this paradise - it is slowly being engulfed by commercialization... One part of the beach is already taken by a posh beach club with sun umbrellas, and, the construction works are in progress so we weren't even allowed to get close to that exact part! It almost made me cry to see how this beautiful paradise is being turned into another crowded resort, because I adore the unspoiled places without thousands of tourists, concrete hotels and ubiquitous stands with cheap, plastic souvenirs. If you also love the off the beaten path and unique spots few know about - you'll fall in love with Albania. 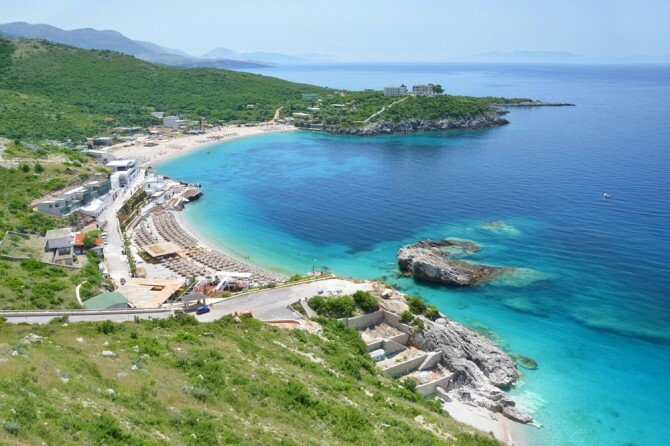 If, on the other hand, you prefer the typical resorts with 5 star hotels, Albanian Riviera might not be up to your standards, though. 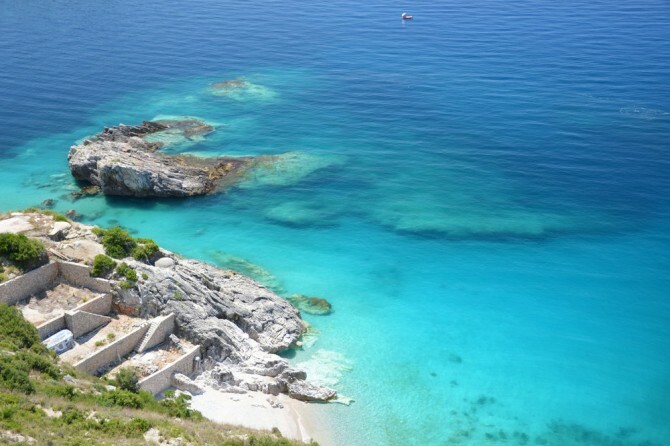 Nevertheless, in the summer, there are great beach parties and tourist spots at Jala and in more popular places. The other part of Jala beach is still wild and open to the public - we went there in June and it wasn't crowded at all - it was so beautiful and peaceful. Gjipe beach is squeezed between high cliffs of a canyon. It's quite difficult to reach, but if you're there you'll know that your effort was worth it. The easiest way is to get there is by boat from Jala beach - you will also be able to get a beautiful view from the sea. You can ask anyone at the beach bar, they can make a deal to take you there for a good price. You can also drive to Gjipe, but soon enough you'll run out of the paved road and you'll have to leave your car, then walk down around 35 minutes along the coast following a narrow path. The views are of course magnificent. Besides the paradise sea and the beach itself, there are many damaged bunkers on the way - their heavy, concrete structure contrasts strongly with the idyllic surroundings. You won't see many people at Gjipe, probably because of its inaccessibility. When we were there, there were maybe 5 other people for the whole day. It feels like a desert island rather than a beach in an European country. Like hidden paradise. If you're tired of Greek resorts which are heavily packed by holidaymakers, this is a perfect place for you to go to! The high, white walls of the cliff form many little beautiful caves around - you can swim into them and find some shelter from the scorching summer heat. Gjipe will remain one of my favorite beaches in the world, provided it will be kept as wild as it is today. If you want to see other hidden and unknown beaches, you might be interested in my post 10 beaches you've never heard of.